In most OECD countries, general practitioners (GPs) play several fundamentally different roles. Clearly, on the one hand, they are responsible for their patients’ health and physical well-being. On the other hand, they also play an often unforeseen, but economically important role: acting as the arbiters of sick leave. This latter capacity is of great fiscal relevance because doctors act as “gatekeepers,” deciding which types of social insurance expenditures and medical treatments are ultimately necessary for their patients. While the GP is probably the person best placed to objectively assess the true health condition of the patient, in a market this position is ripe with skewed incentives and moral dilemmas. For example, if some patients exaggerate or even ‘invent’ health problems to justify paid absence from work, might they, as customers, choose those doctors that are more generous in giving out sick notes? In order to find out how this particular situation affects doctors’ behavior, Knut Røed and Simen Markussen empirically analyzed Norwegian doctors’ standards when it comes to doling out sick leave and the patients’ choices of GPs. In their new IZA Discussion Paper, the experts from the Ragnar Frisch Centre for Economic Research first identified each doctor’s degree of leniency, i.e., the physician’s readiness to give out a sick note to a patient. To do this, they designed an indicator based on the overall certification of sick pay days for each doctor’s patients, taking into account the different characteristics of patients (age, employment, etc.) and the fact that many patients often switch doctors. In a second step, the authors were then able to use this leniency indicator to examine the extent to which workers chose family doctors which were more generous in giving out sick notes. 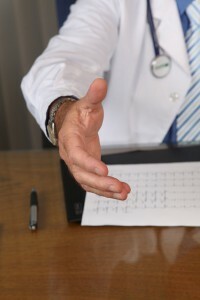 The researchers show that not only do patients choose the more “free handed” doctors, but doctors actually anticipate the “leniency preference” of their customers when choosing their own level of leniency. Moreover, when the local competitive environment changes—for example, when another doctor moves to town, increasing competitive pressure—GPs tend to become more lenient to attract or keep patients. But how much does this actually account for social welfare losses? The authors propose that if all the GPs in Norway received fixed salary contracts instead of letting them run their own businesses, the level of illness-induced absence from work would decrease by roughly 3-4%. Given that the Norwegian physician market has relatively little competition, the authors expect this effect to be much larger in more competitive markets. The study concludes that by combining the incompatible roles of business owner and health provider, GPs are faced with highly contradictory incentives. In such a situation, GPs are forced to decide between performing their “gatekeeping” function in the most ethical manner possible or furthering their financial interests by attracting and keeping more patients as customers.